As promised in the last newsletter, I will give you a bit more information on the new Raclette cheese that we have been using for a little while by now (much to the culinary delight of many of you). 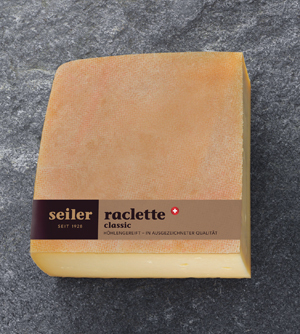 In the recent Swiss Cheese Award, where close to 700 Cheeses in 27 different categories were judged, the Raclette from the Kaeserei Seiler was awarded the “Best Raclette Cheese of Switzerland”. According to history books, this type of cheese was produced as early as 800 years ago, and it is said that even Wilhelm Tell took pleasure in savouring this cheese. In 1928, keeping with tradition, Louis Seiler, started to produce what then was referred to as “Bratkaese” in Sarnen, Canton Obwalden. In the 50’s his son started to take over and ever since it was always considered a well-made and premium cheese. What makes that cheese stand out from the rest is its excellent melting properties, the fine almost-creamy texture and its typical flavour make it such a remarkable product. And we all know how versatile it can be, from Gratin’s to baked polenta, pastas and toasts.